Will fit English or English/Endurance model saddles. Comes with two 20 oz. water bottles. Securely attaches to your saddle with hook and loop straps that secure around your billets. An additional pocket fits over your saddle's cantle, providing a snug fit and decreased pressure on your horse's spine. 420D Ripstop with waterproof urethane backing. 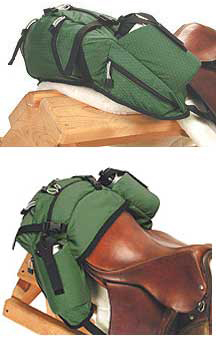 Special cantle sleeve design helps keep the pack off the horse’s back. Five roomy compartments for your equipment. Two insulated water bottle holders. Foam-padded bottom panel lined with durable, soft, short-pile fleece. Additional nylon straps with reinforced tabbed ends, to use at your discretion for additional gear. All outer seams reinforced with durable binding.